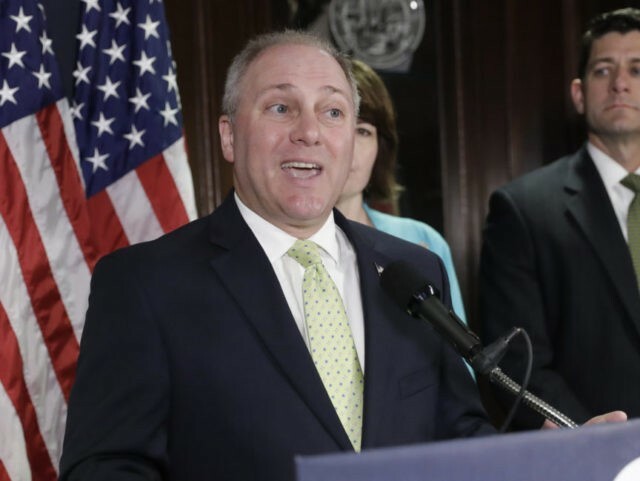 House Majority Whip Steve Scalise (R-LA), approaching the one year anniversary of his near fatal wounding by a crazed shooter, addressed the Faith and Freedom Coalition’s “Road to Majority” conference, where he raised concerns over Big Tech bias against conservatives. “If you think there might be a culture war in this country, the fact that the left and even people in organizations like Twitter and Facebook were literally trying to suppress conservative speech,” Scalise said at the at Washington, DC, Omni Shoreham Hotel, as he endorsed Rep. Marsha Blackburn (R-TN) in her race for U.S. Senate. Scalise related how Blackburn, who chaired the House Select Panel that investigated Planned Parenthood’s sale of “fetal tissue” from abortions, ran into trouble with social media giant Twitter, who banned her campaign announcement video as “offensive” and “inflammatory,” while allowing Planned Parenthood to run ads in support of abortion. “Because Marsha went and exposed this during her campaign, she was actually banned from Twitter,” Scalise told the conference. “When Marsha put an ad up on Twitter, that just exposed the truth about Planned Parenthood, Twitter took the ad down. Earlier in his address, Scalise emphasized the role of God in seeing to his seemingly unlikely recovery from the gunshot wounds he sustained at last year’s Republican practice for the Congressional Charity Baseball Game.